The American Council on Germany collaborated with the Congressional Study Group on Germany, managed by the U.S. Association of Former Members of Congress, to host a delegation of Bundestag members, who conducted a fact-finding mission to Washington, Chattanooga, and Nashville from October 29 to November 1. The Annual Congress-Bundestag Seminar alternates between the United States and Germany and provides an opportunity for Members of the German Bundestag, U.S. Members of Congress, and other distinguished guests to discuss the transatlantic relationship and the role of their countries in solving global challenges in a frank and candid forum. This year’s delegation, led by Dr. Matthias Heider (CDU), Chairman of the Germany-USA Parliamentary Friendship Group and Member of the Bundestag, had meetings focused on transatlantic trade, infrastructure, immigration, healthcare in the United States, and the domestic political outlook ahead of the 2018 midterm elections. Other members of the German delegation included Bundestag Members: Stephan Mayer (CSU), Marja-Liisa Völlers (SPD), Prof. Dr. Andrew Ullmann (FDP), Dr. Gesine Lötzsch (Die Linke), Katja Keul (Alliance 90/The Greens), and Prof. Dr. Harald Weyel (AFD). 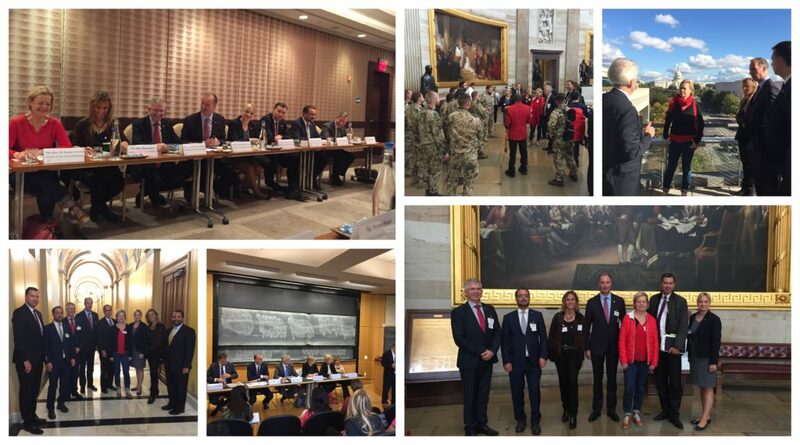 In Washington, the delegation had meetings focused on transatlantic trade and the economic developments with Mike Platt, Assistant Secretary for Legislative and Intergovernmental Affairs at the U.S. Department of Commerce and Dan Mullaney, Assistant USTR for Europe and the Middle East. The mid-term elections were a major topic and included sessions with election pollsters as well as with Jonathan Burks, Chief of Staff in the Office of the Speaker, and Danny Weiss, Chief of Staff in the Office of the Democratic Minority Leader who focused on bipartisanship in Congress. At a dinner reception hosted by German Ambassador Emily Haber at her residence, Congressman Charlie Dent (R-PA) shared his perspectives on the election and the state of transatlantic affairs. The mission included a visit to the Volkswagen plant in Chattanooga with Congressman Chuck Fleischmann (R-SC) and Mayor of Chattanooga Andy Berke (2009 ACG Young Leader), learning about how the company has contributed to economic growth and job creation in the region. Focusing on the intense Senate race in Tennessee, the delegation had several meetings in Nashville that included Dr. John Geer, Dean of the College of Arts and Science at Vanderbilt University and author of the book In Defense of Negativity: Attack Ads in Presidential Campaigns; and Erik Schelzig, Editor of the Tennessee Journal. Dr. Thomas Schwartz, (1989 ACG Young Leader) a professor of European Studies, hosted a town hall with students from Vanderbilt University and the Bundestag delegation which focused on immigration/integration and the rise of populism in Germany. Congressman Jim Cooper (D-TN) and Deputy Governor of Tennessee Jim Henry discussed the changing politics and electorate in Tennessee, and the directors for the Phil Bredesen for Senate and Karl Dean for Governor campaigns provided insights on the current campaign and the issues of relevance to voters in Tennessee. Former Congressman and Mayor of Nashville Bob Clement accompanied the delegation while in Tennessee, sharing both the history of politics in the state and current trends. ACG Warburg Chapter Director and German Honorary Consul Doug Berry (1992 ACG Young Leader) met with the group to discuss relations between Nashville and Germany. ACG Member Paul Gallagher hosted a breakfast session at his company, Pinnacle Financial Partners, that included a panel discussion on innovation and entrepreneurship in Nashville with Charlie Brock, President & CEO of Launch Tennessee, Sid Chambless, Executive Director of Nashville Capital Networks, Brian Moyers, President & CEO of the Nashville Technology Council, and Julia Polk, Chief Strategy Officer and CFO of IQuity, Inc., a local startup. The next Congress-Bundestag Seminar will take place in 2019 when a delegation of U.S. Members of Congress travels to Germany.